Lindsey Knapp is no stranger to the rough-and-tumble world of competitive sports as she played on the men’s lacrosse team in high school since her school in Arnold, Missouri, did not have a men’s team, and now she is helping others stay in the game. 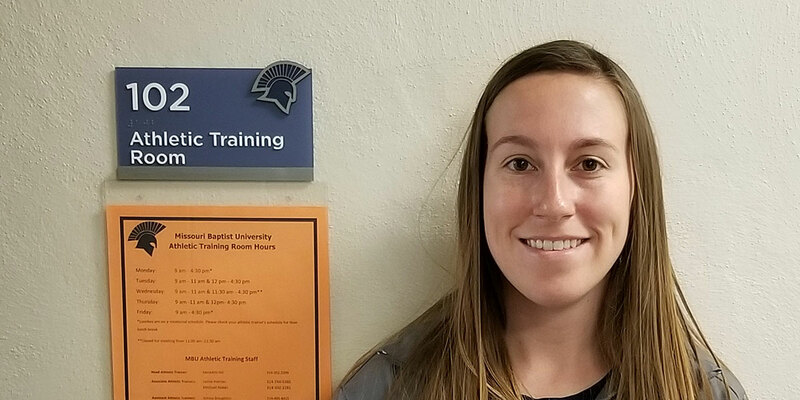 Lyndsey Knapp, an athletic trainer for MBU who is finishing her master’s degree in fitness management this month, has enjoyed the one-to-one interaction with athletes as she has helped them work through injuries to get back into competition, and now she is moving on to her next challenge in life. As a high school student she played men’s lacrosse — that’s right, men’s lacrosse — now Lindsey Knapp spends her days taping up and stretching out athletes in the Missouri Baptist University athletic training room as a graduate assistant athletic trainer. “Have you ever watched a professional sporting event? Have you seen the person that runs out onto the field when an athlete goes out? That is an athletic trainer,” said Knapp, who is finishing her master’s degree at Missouri Baptist University this month. Growing up Knapp, 24, had a passion for sports, which began with track when she was in elementary school, but grew into a passion for lacrosse when she entered middle school and began playing. When Knapp entered Fox High School in Arnold, Missouri, the entire lacrosse experience changed for her. “My high school … did not have a lacrosse team for women, which is how I ended up playing with the guys,” said Knapp, who played varsity for the Warriors her junior and senior years. Knapp’s lacrosse career did not end in high school though, but continued as she entered college. At Tennessee Wesleyan College in Athens, Tennessee, Knapp switched back to playing women’s lacrosse after four years of playing by the rules of the men’s style of the sport. The athlete took advantage of her college opportunity, pursuing a bachelor’s degree in athletic training. Knapp went into the field of athletic training because she wanted the opportunity to help athletes grow through her knowledge of the human body and the techniques she learned while in college. Knapp’s job as an athletic trainer includes more than just making sure muscles are loose though, she also helps athletes who are recovering from injuries do rehabilitating exercises and stretches to help them heal faster while preventing further injury. “The practice of athletic training encompasses the prevention, examination and diagnosis, treatment and rehabilitation of emergent, acute, subacute and chronic neuromusculoskeletal conditions, and certain medical conditions, in order to minimize subsequent impairments, functional limitations, disability and societal limitations,” explained Knapp. Athletic trainers have many different tools to use to help prevent injuries in athletes. Knapp said she spends most of her time in the MBU training room using suction cups and stainless steel tools to loosen up sore muscles in the soccer and lacrosse players she is in charge of treating. The athletic trainer is also in charge of concussion protocol and making sure all athletes are cleared to play in games and even practice. “Whenever I am injured or hurting, Lindsey finds a way to treat me so I can play,” said junior lacrosse player Kimmi Mathews. Though she enjoys the hands-on aspect of being an athletic trainer, there are a few aspects she doesn’t always enjoy about her job. “Paperwork and cleaning duties are probably the part of my job that I dislike the most,” said Knapp, who also attended Missouri State University before arriving at MBU in 2016. Of course any job will have its ups and downs, but Knapp knows how to find the positives in her job. You can even find her at the women’s lacrosse practice taking shots and scoring goals on the team when the coach asks her to step in to help out. Knapp is in her second year at MBU, and will be leaving this spring when she finishes her graduate studies. She is not completely sure what she wants to do just yet, but she’s starting to get an idea. She is driven by a thirst for knowledge of the human body, which is why Knapp would like to work somewhere she can continuously learn new styles and techniques of rehabilitation and athletic training once her time at MBU is up. Knapp will surely be missed by her athletes after she completes her master of science in fitness management this month, but she would like to leave them with some advice before she goes. Claire Donohue is a junior public relations and marketing major at Missouri Baptist University. She is a member of the women's lacrosse team, and came to the university on an athletic scholarship. Donohue's goal is to go into advertising once she graduates with her dual degrees, but for now she works in customer service at her local Shop 'n Save and as a nanny.